Click on link to open handout in new tab/window, or right-click then 'save link as' to save a copy to your device. Links to other learning resources. Website associated with national scheme to support teachers and their students. Reports from previous training courses or news will appear here. A simulator workshop (see notice on LACR website) was held at St Anne's Parish Church in mid November. 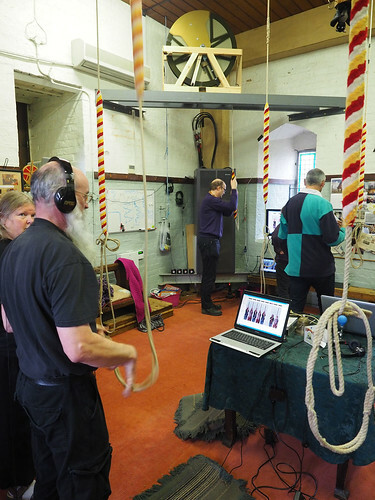 This newly installed (2017) bellringing training facility was being used to explore the opportunities it offered to individuals (learners) and for training officers. There was a tangible 'buzz' of excitement and interest, and a hive of activity from several independent training sessions taking place at the same time. The tower is quite large and had sufficient space in one corner to have a 'dumb bell' that could be rung even as all the other bells are rung. This had a set of headphones for the learner, a computer and a large computer monitor. 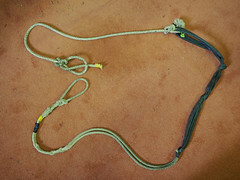 Two other bells had been tied with a very effective rope and bicycle inner-tube arrangement (see photo) with one rope loop attaching to the flight of the clapper, and the inner tube being secured over the crown staple, and the other rope loop being pulled using the stretch of the rubber inner-tube to hook over the clapper flight from the opposite side. Quick and simple to fit and remove. The new version of ABEL was being used, which has a relatively new interface with video animated ringers instead of the old circle of rope images that just flipped from being a tail end to a sally. The new animations showed a pretty fluid action which could be used for practice with ropesight. Historically I have found that ringing with ABEL was restricted to 'listening' practice, and this was great while you are roughly in the right place but was very hard to recover once you got too far out of place, and more often than not had to start again. With the new ABEL, initially I found myself reverting to listening mode (that I was familiar with) for plain hunt, but then I started to try use the ropesight with the simulator - which began poorly because it was less familiar, but improved with practice. Before the end of the session I was using the ropesight to ring St Clements reasonably well, which is more advanced method ringing than anything else I had done using a simulator before. The new interface also has additional real-time visual clues to your performance that helps you to improve as you ring. Each animated ringer displayed on screen has a bar above them with their bell number. The slot for you works best I found if disabled the animation for my ringer (was distracting otherwise), but importantly instead of bell number at the top, it has a colour coded bar. If you ring within narrow tolerance (essentially spot on) you get complete bar in green, if ring early then just the left half of the bar is coloured in shades going from green to amber to red depending on how far out of place you are ringing early. Similarly the right hand side of the bar is coloured if you ring late in same colour coding. At the end of the practice piece, ABEL presents an overall score out of 10 (best I did was 8.8, worst about 5.2! ), and allows you to review the striking to see if there is any pattern such as always slightly late on backstrokes, or handstroke gap is not enough. However the simple score out of 10 became a challenge to have another go to improve striking and get a better score... almost like a computer game with a rope instead of a Kinnect controller! If it makes me excited to have another go at my age, I can see it will have appeal for younger more competitive and computer savvy ringers. The simulator can also be used to allow all bells to be rung tied to have a 'silent practice' for residents and passers-by outside the church, but audible inside the ringing room using audio speakers. In this way it is possible to have extended teaching and ringing sessions for whole range of ringing from basic handling practice to full practice with rounds & calls, plain hunt, method, touches etc. without disturbing the neighbourhood and so avoid any potential complaints.